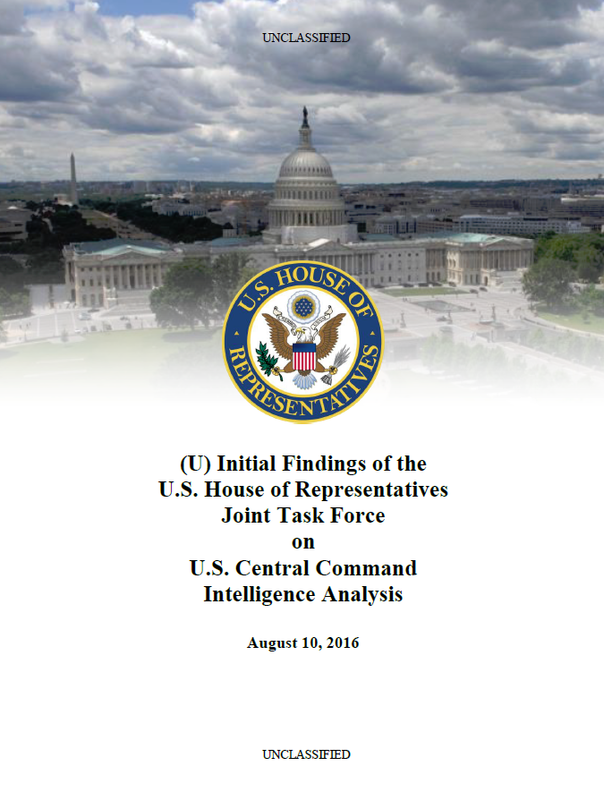 (U) The Joint Task Force was created by the Chairmen of the House Armed Services Committee, the House Permanent Select Committee on Intelligence, and the House Appropriations Subcommittee on Defense to investigate the allegations of a whistleblower that intelligence produced by U.S. Central Command (CENTCOM) had been manipulated to present an unduly positive outlook on CENTCOM efforts to train the Iraqi Security Forces (ISF) and combat the self-proclaimed Islamic State of Iraq and the Levant (ISIL). Although investigations into the whistleblower’s allegations continue, the Joint Task Force has conducted sufficient investigation to reach certain interim conclusions. Those conclusions are contained in this report. However, the Joint Task Force awaits the completion of the ongoing Department of Defense Inspector General (DODIG) investigation into this matter. (U) Based on its own investigation, the Joint Task Force has substantiated that structural and management changes made at the CENTCOM Intelligence Directorate starting in mid-2014 resulted in the production and dissemination of intelligence products that were inconsistent with the judgments of many senior, career analysts at CENTCOM. These products were consistently more optimistic regarding the conduct of U.S. military action than that of the senior analysts. Based on specific case studies evaluated by the Joint Task Force, during the time period evaluated by the Joint Task Force, CENTCOM produced intelligence that was also significantly more optimistic than that of other parts of the Intelligence Community (IC) and typically more optimistic than actual events warranted. Additionally, many CENTCOM press releases, public statements, and congressional testimonies were also significantly more positive than actual events. (U) The leadership environment within CENTCOM and its Intelligence Directorate deteriorated significantly following the 2013 departure of Marine General James Mattis and his senior intelligence leaders. Survey results provided to the Joint Task Force demonstrated that dozens of analysts viewed the subsequent leadership environment as toxic, with 40% of analysts responding that they had experienced an attempt to distort or suppress intelligence in the past year. While the Joint Task Force heard testimony that the environment slowly began to improve following the initiation of the DODIG investigation in mid-2015, many issues persisted until the arrival of Army General Joseph Votel and the new head of CENTCOM’s intelligence directorate (also known as the J2). (U) Starting in mid-2014, CENTCOM Intelligence Directorate leadership instituted various organizational and process changes that negatively affected the quality and timeliness of intelligence production. CENTCOM senior leaders claimed these changes were intended to improve analytic tradecraft and timeliness, but the changes ultimately were unsuccessful and had the opposite effect. Many of these changes in the review and coordination process have since been reversed. (U) Furthermore, senior leaders also relied on details reported from coalition forces rather than more objective and better documented intelligence reporting. The Joint Task Force can find no justifiable reason why operational reporting was repeatedly used as a rationale to change the analytic product, particularly when the changes only appeared to be made in a more optimistic direction. By supplanting analytic tradecraft with unpublished and ad hoc operational reporting, Joint Intelligence Center (JIC) leadership circumvented important processes that are intended to protect the integrity of intelligence analysis.